Most of the bookshops I visit, I do so as part of a journey. They're either a diversion along the route I'm taking, or even a dedicated journey in themselves, but every now and then a bookshop fits happily into a trip I'm already on. In the case of this week's bookshop, I'm crediting it with the latter. That's because it involved only a very a tiny diversion around the tube network as part of my latest Books are my bag bookshop crawl (if you can remember all those many months ago? 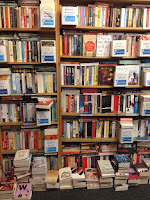 ), but for many this bookshop will be part of their everyday lives. They'll see it in the morning on their way to work and again on their return trip. Many commuters on trains may pass through the tube station it's in without even a second thought. Depending on whether or not their travel involves walking through Old Street Station or training through and missing out, I envy or pity these people because I would absolutely love to be able to include Camden Lock Books in my daily routine. First things first, the more knowledgeable among you will note Old Street Station is nowhere near Camden Lock. If only I'd been so observant many months ago when I set out on a trip to Camden with the intention of finding this bookshop. Fortunately for me on that day I did still find two other bookshops (which you can read about here and here) but I was left wishing I'd done more than assume when it came to geography. 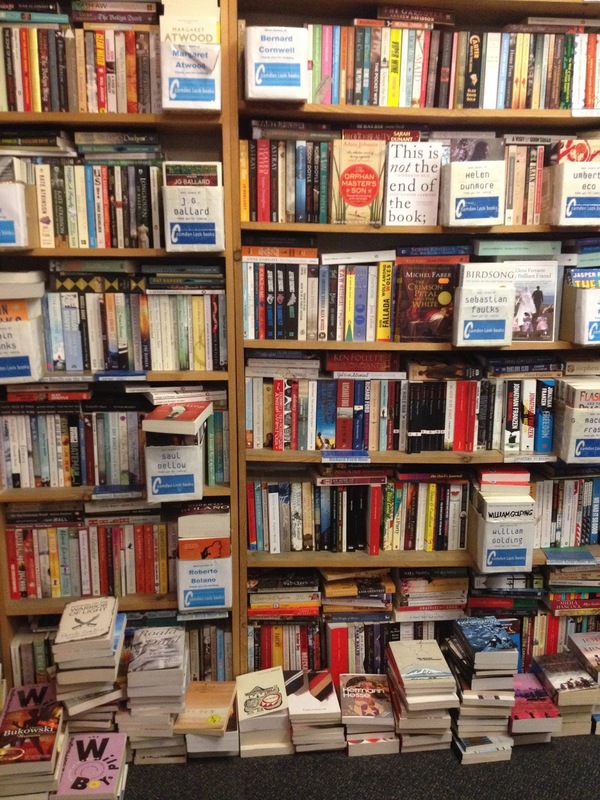 * Not that such confusion really matters, I've since visited this bookshop and can tell you it was worth the wait. 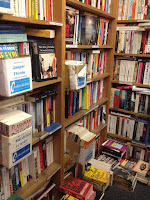 It's a large space, opening into an L-shape room with walls of shelves crammed with new books, a huge recommends table that includes discounted titles and piles of books scattered by the walls. 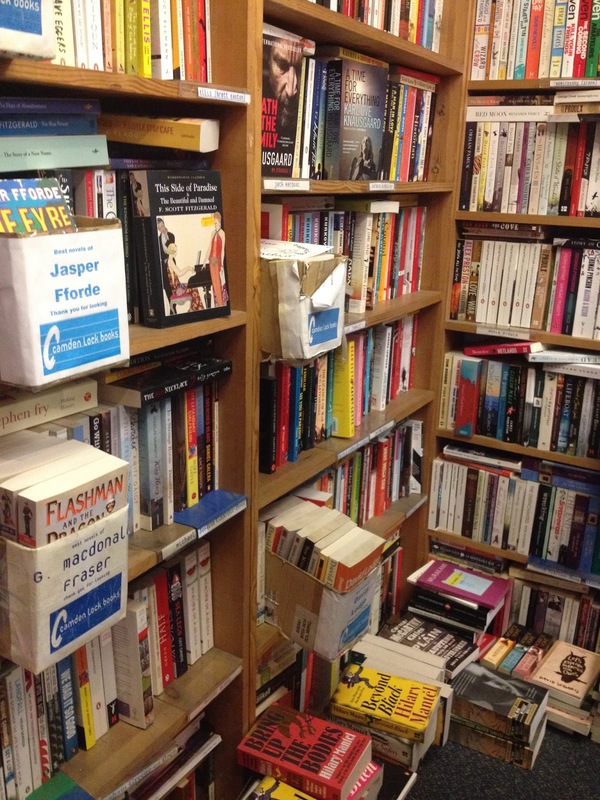 All of which help make the bookshop a place to enjoy, to explore, to rummage in. Details such as boxes on shelves filled with books by one author or another, or the blink-and-you-miss-it door to the art room at the large non-fiction end of the L all add to the experience. And did I mention the selection of three for two offerings? The trouble here would be limiting yourself to three. I found myself wandering back and forth between the science fiction, general fiction and recommends tables and was especially tempted by a good selection of Raymond Chandler books, before eventually forcing myself to stick to one title with a very small price tag: Joe Haldeman's The Forever War. I'm always happy to pay full price for a book (authors and bookshops deserve every penny for their dedication to readers) but when a price is reduced it certainly makes the decision to buy even easier. All of these things, along with the requisite friendly bookseller, saw me wishing more tube and train stations were home to proper bookshops. Because how could any train journey ever be boring if it starts with the purchase of a book? * For those who are wondering, later enquiries inform me the bookshop kept its name when it relocated. Oh! I'm now so very jealous of you! And pleased to know the bookshop has such a good customer too. It's always good to hear when people appreciate their local.